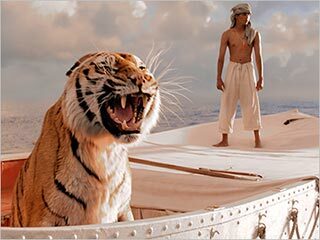 Life of Pi is a difficult movie to write about because it encompasses so much of the human experience – it covers man’s relationship to himself, his family, his environment, and God – but its perspective on those experiences is elusive. This opacity, however, is not a flaw; on the contrary, it is evidence of a nearly perfect central metaphor: a boy and a tiger trapped together on a boat, lost at sea. If you try to pin down the meaning of this metaphor, it will elude you, but it will also speak to you in ways that feel both ancient and eternal. Pi is the unusual nickname of a young Indian boy, whose live with his family on the grounds of the zoo that his father runs. He spends his childhood in curiosity, asking questions about the animals, religion, life, and girls – not necessarily in that order. Seeking a better life, the family sets sail for Canada, but a mysterious shipwreck kills most everyone on board. After a tumultuous escape from the sinking vessel, the boy wakes up in a lifeboat with four other refugees – a tiger, hyena, orangutan, and zebra. The newly-orphaned Pi must now put his knowledge of himself and the world into practice, particularly in his complex relationship with one of the animals, a vicious Bengal tiger. As the boat drifts through the Pacific Ocean, Pi finds that he and the tiger’s fate are intertwined. To ensure that he does not become the beast’s next and last meal, Pi must keep him well-fed. Here is the beauty: through this central metaphor, the script touches on themes of interconnectivity between man, animal, and the environment, but it does not whitewash the brutal realities of the natural world. This tiger is no Disney character, anthropomorphized and extricated from his animal nature; in fact, the contrast between his brutality and Pi’s ethereal views on life and religion is the film’s true subject, as both are necessary for Pi to self-actualize. As the eponymous character, the teenage Suraj Sharma effortlessly achieves the arduous task of holding our attention while being the sole human actor on screen for most of the film. He does most of his acting against a green screen – the tiger was created using a mix of four real-life tigers and a whole lot of computer-generated imagery, but never was Sharma actually in a room with a live tiger. The connection between Pi and the tiger is the most essential element of the film, and it would never work without the terrific performance given by the young actor. But director Ang Lee deserves the lion’s (or tiger’s, as it were) share of credit, especially for the stunning visual palate, which carries the film in the few moments that the story lags. The visuals serve the intended opacity of the story, blunting the mind so that it is not distracted by a deeper search for meaning. There will be plenty of time for that after the film ends; the overwhelming visual artistry keeps us in the moment. It is a masterstroke by Lee, who has had a long and accomplished career. With Life of Pi, however, he has created a film with no precedent. This is a break from his career trajectory, which has largely relied on genre films. Forgoing the domestic drama of The Ice Storm; the Victorian-era romance of Sense and Sensibility; the superhero origin story of Hulk; or even the frontier romance (unorthodox as it was) of Brokeback Mountain, Lee has brought this story to life with singular vision and immense narrative power. Still, Life of Pi is not without its flaws. It features, for example, the clichéd framing device of a man telling his story to an audience surrogate, a narrative tool that should surely be retired. But that middle third, in which Pi struggles to balance survival with grace, is pure art and pure joy. Pi’s struggle is our own, and if we never figure out quite what it means, then credit should be given to the makers of this wondrous film for asking all of the right questions.